A sizable percentage of ecommerce shoppers abandon the checkout process. Many of these abandonments are preventable with simple improvements. After all, those shoppers have already invested time and effort finding and selecting the items. With the following plugins for your WordPress ecommerce site, you can optimize the checkout process, making the experience better for your shoppers. You’ll benefit from more sales. Sometimes more than one person makes a purchase decision. The Email Cart WooCommerce plugin allows the primary shopper to share his current cart with another via email. Once the products have been added to the basket, the first shopper can email a link to someone, who can view the contents of the basket and add more items or check out. This is also useful when a shopper selects the items, but another person is using her credit card to pay for it. Another use of this plugin is for special promotions. A merchant can configure a shopping cart filled with items for, say, a one-time package and then use that link in an email newsletter. When recipients click on the link, they’ll arrive at the shopping cart with the products already loaded, where they can conveniently make the purchase. Visitors sometimes need a nudge to share your website on social networks. Monetary incentives are good motivators. 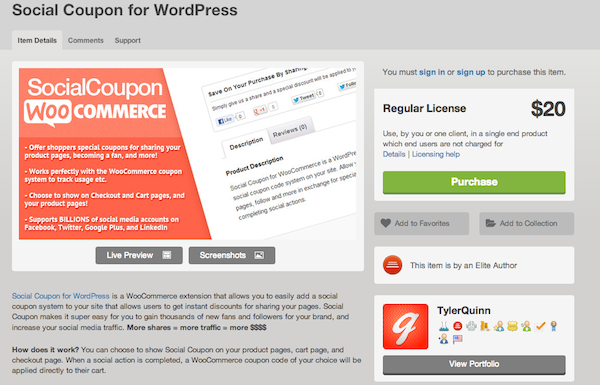 The Social Coupon for WordPress plugin is a WooCommerce extension that rewards users for sharing your content socially. It allows a merchant to use the native WooCommerce coupon system to give shoppers instant rewards for sharing your site. 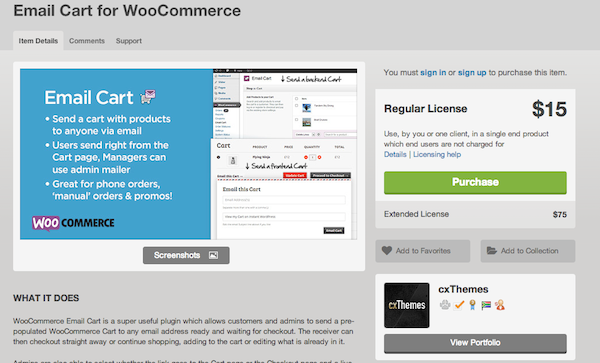 You can set up the plugin to appear on the cart page, checkout page, or product page. Once the shopper completes a social sharing action, a discount is automatically applied to the order. This plugin could generate many additional social media followers who have already purchased from you. And it reduces cart abandons because shoppers presumably want to complete the transaction to obtain the discount. Wishlists are powerful selling tools. Amazon uses them to great effect; they appear every time the wishlist shopper visits the site. You can add similar wishlist functionality for your own shoppers with the DVin WooCommerce Wishlist plugin. This plugin inserts an “Add to Wishlist” button on your product pages. This is helpful for products that take a more thought and deliberation before purchasing, and it reminds the wishlist shopper when he returns to the site. Wishlists can be public or private and can be shared socially or emailed with a unique wishlist URL. This plugin is also helpful for consumer-focused sites with many products, which users might forget about without a wishlist. You can show consumers their wishlist every time they revisit your site. Unnecessary or missing fields are one of the top conversion killers in the checkout process. Shoppers don’t want a long list of form fields asking for unnecessary information. Conversely, if shoppers experience confusing forms, or forms with missing fields, they could leave. 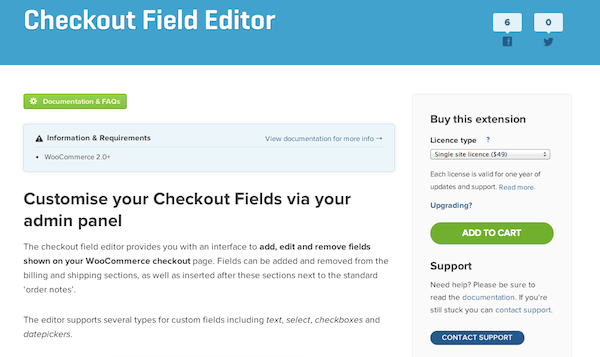 The Checkout Field Editor extension for WooCommerce makes it easy for a merchant to add and remove form fields. 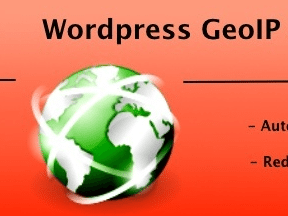 Merchants that have purchased this plugin have offered much positive feedback. It solves a common problem of managing the optimal number of checkout fields. Merchants can easily add and remove fields from the billing, shipping, and “order notes” sections. The types of supported form fields are text, select, date picker, and checkbox. Use this plugin to make optimizing your checkout flow much simpler. Companies of all sizes reward loyal customers. 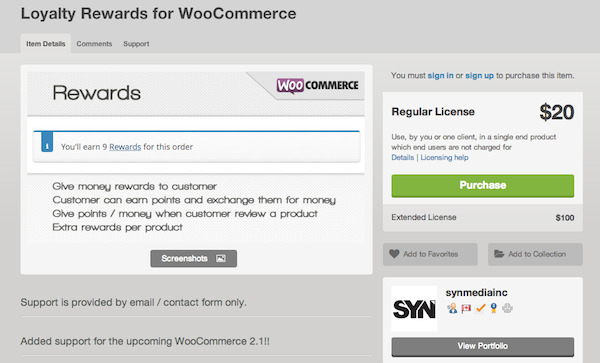 WooCommerce merchants can do it, too, with the Loyalty Rewards for WooCommerce plugin, which allows customers to earn points on every purchase and redeem them later. This encourages customers to purchase more frequently, to grow rewards points — similar to frequent flyer miles at airlines and loyalty rewards at Starbucks. After customers purchase items, they’ll earn points redeemable for discounts on future purchases. The merchant can adjust the amount of points and the rewards. This plugin also allows customers to earn points by posting product reviews.